When you hear talk about German watchmaking, it’s Nomos and Lange that seem to get the most attention. But that’s missing a big part of the conversation. Last year we took you inside Glashütte Original‘s manufacture, and today we have a watch for you that really shows off what the Saxon powerhouse is capable of. The new Senator Chronograph Panorama Date debuts the caliber 37, an automatic, fully integrated, in-house, column wheel, flyback chronograph movement with a panoramic date function. This watch is no joke, people. There is a lot to cover here, but let’s start with the basics. There are two versions of the Senator Chronograph, one in red gold and one in platinum. Both have the same basic 42mm case shape, with steep brushed sides and polished lugs and a slim polished bezel. The platinum version has a cabochon set into the crown while the red gold version is signed with the “GG” logo. The pushers are rectangular, but with soft edges, giving them a more refined feel. 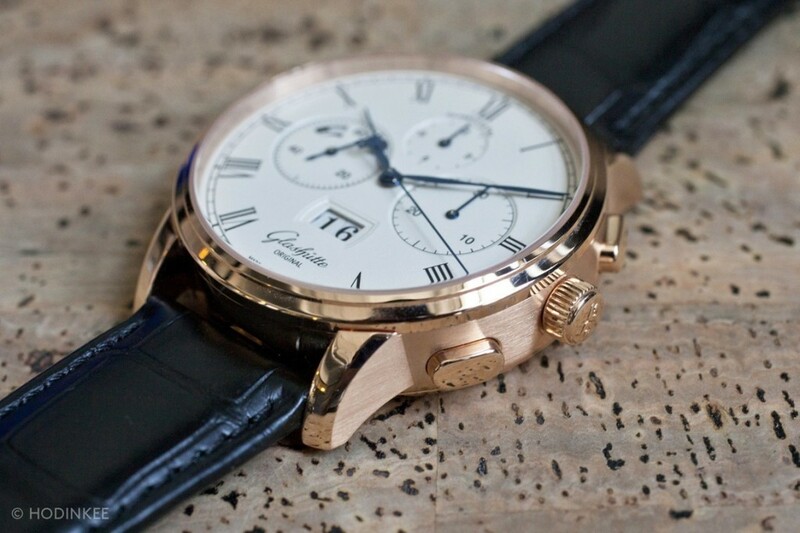 The rose gold model has a grained silver dial with dark black printing, which the technique used to create the platinum model‘s dial is a traditional German method called Anreibenversilberung. This means that a polished gold plate has the numbers engraved and then filled with a colored substance before a special plating process is used, involving fine silver power, salt, and water. This is how the heavily grained silver finish is achieved. While they both also have roman numerals for the hour markers and arabic numerals for the date and subdials, the platinum chrono has a tachymeter scale around the outer edge that really looks great. Blued steel hands combine with the inky printing for a high-contrast look that suits the overall aesthetic. Up at 12 o’clock you have the 12-hour totalizer for the chronograph, and working clockwise you’ll find the 30-minute totalizer, the panoramic date aperture, and the running seconds register, which also houses the recessed power reserve indicator. It’s a lot of information, but it’s arranged in a logical and familiar way so you don’t get too overwhelmed. Now let’s get technical. 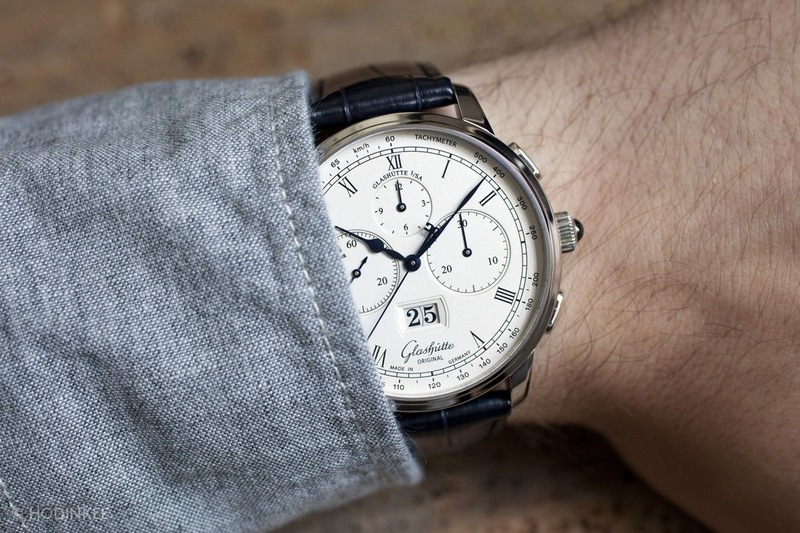 Powering the Senator Chronograph Panorama Date is a new movement for Glashütte Original, the caliber 37. This movement packs a big punch. It’s a fully-integrated flyback chronograph with a column wheel as well as power reserve and panoramic date indicators baked right into the design. Beyond ticking the big boxes required for a serious in-house chrono movement, Glashütte Original also made a number of small refinements, including implementing a lever structure for interacting with the column wheel that places everything on the same plane, giving you more precise and consistent engagement. Also, GO included a new oscillating system with a swan-neck adjustment system and a balance wheel that only requires four regulation screws. There is also no regulator fixed directly to the spring, letting it act more freely. The caliber 37 achieves a 70 hour power reserve with only one barrel. It is, however, automatic, which, while practical, does detract a little from the overall purity and beauty of the movement. The rotor is nicely finished, but this movement has such awesome architecture and we’d love to see more of it through the sapphire caseback. It’s a small complaint, but one worth noting. Looking at some of the details across the watch, you’ll find a lot to love. There is a small quick-adjuster for the panoramic date set into the caseband, the date jumps instantaneously, and the minutes counter for the chronograph jumps semi-instantaneously. If you choose to manually wind the watch, the power reserve indicator fills up smoothly and both the motion of all the hands and the feel of the pushers and crown are spot on. This feels like an extremely high-end watch from top to bottom. On the wrist, the Senator Chronograph wears nicely as well. At 42mm across and 14mm thick, it’s a not a small watch by any means, but the shape manages the heft nicely. The lugs are short and arched, and the slim bezel keeps the dial looking big and bright without giving the watch the overall appearance of being too large. In platinum especially it is rather heavy, which is to be expected with a watch like this, but it’s something to be aware of. At this point, I wouldn’t be surprised if you’re thinking “So is this Glashütte Original‘s Datograph?” And the answer is a heavily qualified “sort of.” Sure, if we compare this to the Datograph Up/Down, there is a lot in common. Both are high-end flyback chronographs packed with tons of technology that offer integrated power reserve indicators and big date complications to the mix. It’s definitely a comparison worth considering. But the two watches have very different priorities and offer very different things at the end of the day. The Datograph’s movement is a true purist’s chronograph – it’s manually wound and places a lot of emphasis on the elaborate hand-finishing of every lever and wheel. On the other hand, the Senator Chronograph has both a 12-hour totalizer and an automatic winding system, offering additional functionality and practicality. There is also price to consider – at $90,700 in platinum, the Datograph is almost twice the price of the comparable Senator and just short of three times the price of the red gold version. 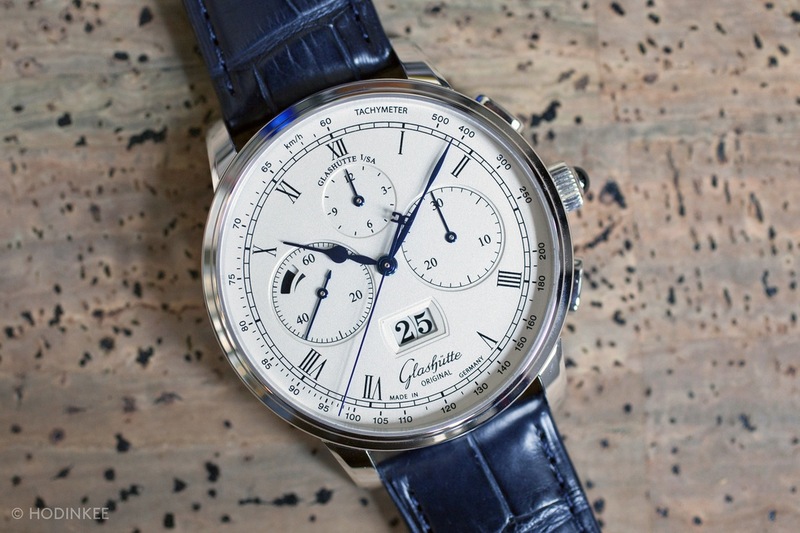 Overall, the Senator Chronograph Panorama Date is a big step for Glashütte Original. 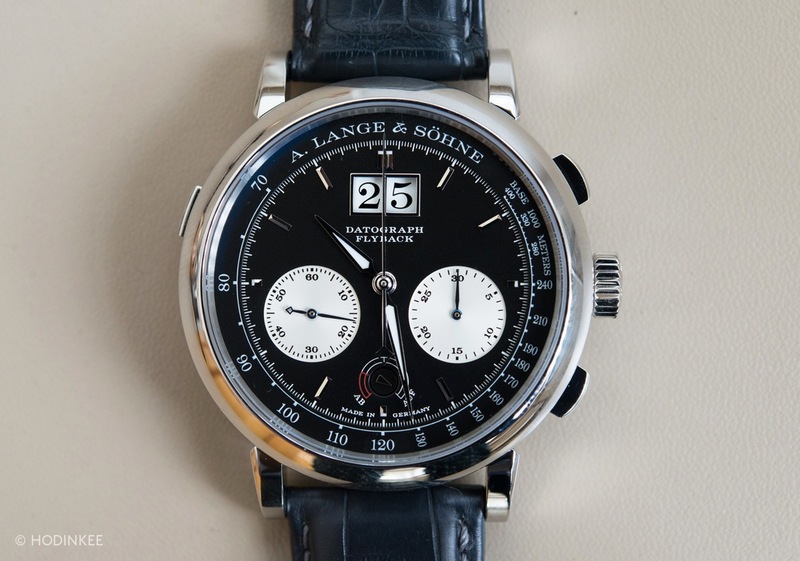 It’s a functional take on the high-end chronograph that offers a lot of technology in a well-designed package. You are getting a lot of watch for your money and its clear wearing the watch that a lot of thought and effort has gone into each and every component. 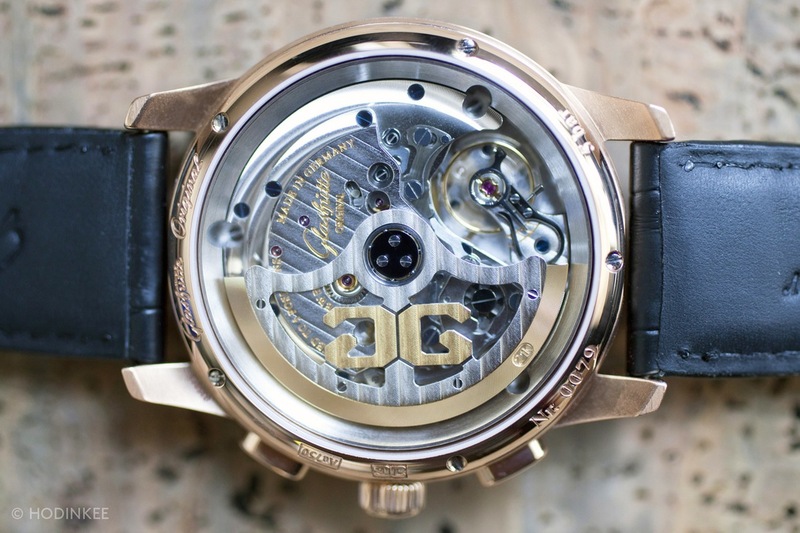 The Glashütte Original Senator Chronograph Panorama Date is priced at $31,500 in red gold and $55,600 in platinum.